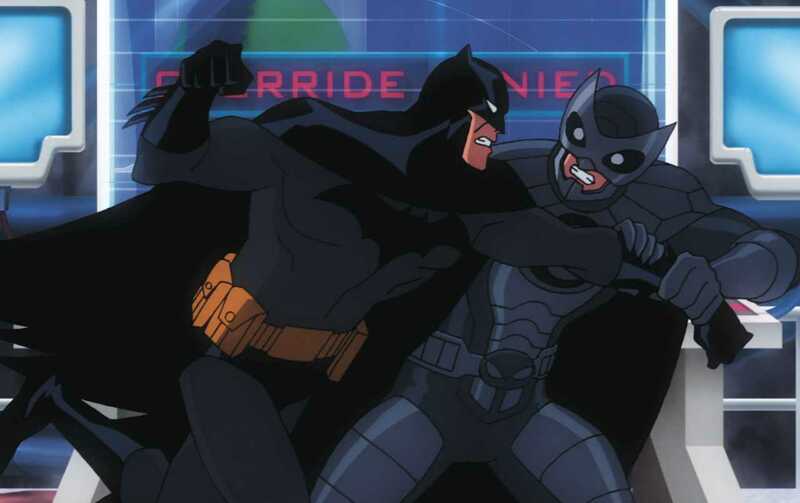 DC, the animation house responsible for Batman and Superman, have in the last few years brought their stable of superheroes to life in a series of direct-to-DVD feature films. From the aforementioned mainstays to less popular heroes Wonder Woman and Green Lantern, each has gotten a crack at the spotlight. But despite extended length compared with their television series and PG-13 ratings, I found that two recent installments don't always do their heroes justice. Superman/Batman: Public Enemies is based on the first six issues of the Superman/Batman comic book that launched in 2003. When Lex Luthor is elected president, one of his first acts is to declare his two arch-nemeses enemies of the state. With villains out to collect the bounty and vigilantes-turned-soldiers determined to follow the letter of the law, Batman and Superman have few places left to turn. The plot consists mostly of blows being traded among a cavalcade of DC superheroes. While this who's-who of the DCU can be fun for fans of the comics, it doesn't leave much room for character development. There are a few insightful moments, be it in dialogue or in cooperative battle tactics, that reveal Superman and Batman's relationship and ability to work as a team, but mostly it's just one action scene after another. Batman and Owlman face their counterparts. Public Enemies was followed this February with DC's seventh and most recent video release, Justice League: Crisis on Two Earths, in which our heroes — Superman, Batman, Wonder Woman, The Flash, Green Lantern, and Martian Manhunter — travel to a mirror universe, where heroes are villains and vice versa. Such an encounter could be a fascinating opportunity to delve into what makes someone be good or evil, but the running time of just 75 minutes affords little opportunity for backstory or character development. The most screen time is given to the trinity of Superman, Batman, and Wonder Woman and their evil counterparts: Ultraman, Owlman, and Superwoman, but the only meaningful dialogue is given to Batman and Owlman. There is a superficial love interest for the Martian Manhunter, but it's not explored in any real depth. Being such a short film, the plot has to move fast. The Justice League's first melee with the Crime Syndicate occurs just 12 minutes into the film, resulting in an exciting airborne battle. In this scene and throughout the film, the Justice League fight mostly random super-powered troops; the movie doesn't pit our heroes against their equivalents until about the one-hour mark. Again, the animation is top-notch, though there remain instances where CGI is not as seamlessly integrated as they could be. It would've been clever had Batman, Owlman, or both been played by familiar voice actors, such as Kevin Conroy. But we do instead get excellent performances with James Wood as Owlman, Gina Torres (Firefly) as Superwoman, Bruce Davison (X-Men) as the POTUS, and Kari Wuhrer (Sliders) as Black Canary. Both movies feature trailers and featurettes that we've seen on DC's other DVDs, which doesn't make for very "special" features. A notable exception is Crisis on Two Earths, which includes an original short film starring The Spectre, the DC universe's manifestation of God's spirit of vengeance. These two animated films feature top-notch production values and are true to their comic book origins without requiring viewers to be familiar with their other animated incarnations. But I couldn't help but feeling that the PG-13 rating was used not to explore mature themes and characters, but to show grittier slugfests. I don't need "mature" to mean "dark", but I do want to see characters embark on a journey, tackling issues with more than their fists. Superman Returns, released to theaters in June 2006, was a mixed success: it raked in $391 million from the worldwide box office — a lot of money, but well short of the $500 million expected. Critics were also, well, critical: some found male lead Brandon Routh dull, the plot lacking in action, and the inclusion of Superman's son unnecessary. But Superman fanboys, even those who can are not blind to the film's shortcomings, still love the film and want even more from it. The various teasers and trailers released at the time revealed footage not seen in the final cut, so we hoped those pieces would be restored in the DVD edition. And though some deleted scenes were indeed made available, there remain even more that were not. As an owner of the original Superman Returns DVD, I would buy another edition and so hope this petition succeeds — but I don't think it will. First, Superman Returns is likely to be dismissed in whatever film is next for the superhero; the potential for a reboot could be confused by further promotion of this film. Second, the Richard Donner cut was a unique situation in which studio politics prevented his vision for Superman II from being realized for more than two decades; I don't know of any similar dissatisfaction on Bryan Singer's part. Finally, since DVDs have regional releases, I'm not sure if it hurts, or is immaterial to, the cause that the petition is based in Argentina. Nonetheless, you can follow the cause on Facebook or Twitter, though neither have been updated in the last two weeks, just two days after the above trailer was posted to YouTube. Perhaps this cause was just a superhero fly-by-night. Hat tip to the BlueTights Network. This summer will see the release of Transformers 2 and its Sunbow counterpart, G.I. Joe. They are two representatives of a trend to translate animated cartoons to live action, an effort that was not met with great success in the 1987 release of He-Man (starring Dolph Lundgren, Frank Langella, and Robert Duncan McNeill). Considering how poorly I received the 2007 Transformers film, I wonder if any animated property can result in a successful transition to live action. Some enterprising fans are not waiting for big-budget studios to get their grubby mits on their childhood memories and are instead making their own trailers. Rather than cast second-tier actors, these independent producers have repurposed existing media and have masterfully manipulated them to their own ends, allowing for some creative and recognizable casting decisions. First up is Thundercats, featuring the feline humanoids of the planet Thundera in a show that employs elements of both fantasy and science fiction to good effect. The Thundercats remind me of another team of super-powered beings… wolverines are cats, aren't they? On July 28th, DC Comics releases straight to DVD the animated feature Green Lantern: First Flight, the latest in a series of such DVD hits. We previously saw Hal Jordan's superhero origins in Justice League: New Frontiers, the difference being the upcoming film focuses on his solo adventure, rather than part of a group. Regardless, I think it's time to take Hal in a new direction, don't you? And who better to take up the mantle than Nathan Fillion? There's no guarantee that these adaptations would prove any more successful than others based on animated franchises — heck, they could still stink. But kudos to the folks who love and respect these characters for being the first to bring them to life. Watchmen premieres Friday, March 6th, courtesy the recent resolution of legal issues between distributor Warner Bros. and Fox. See the full trailer here. But to the casual viewer — the vast majority of moviegoers who have never read, or even heard of, a 21-year-old graphic novel — the above montage will likely be unintelligible. It clearly portrays a dystopian setting, but its variety of brooding characters does little to suggest a storyline. I expect the movie will be successful in capturing the book's themes; what I question is the studio's ability to sell it. Will they call it a cross between Sin City and 300? Their pride in Watchmen's printed origin is evident, and given the recent success of other comic conversions, there's certainly nothing to be ashamed of. So they're likely to continue promoting that background, unlike Constantine or Road to Perdition, which you'd think were meant for the silver screen. It will be interesting to see the evolution of public perception as we near the watching of Watchmen. Filed under Films, Humor; 4 comments. Today is the release of The Dark Knight, for which I, a diehard DC comics fan, am not waiting in line to see. I was thoroughly underwhelmed with its predecessor, Batman Begins — Christian Bale just isn't the man to portray Gotham's caped crusader. That opinion is a happy consequence of the fact that there isn't one right way to portray the Dark Knight. There have been many interpretations of the character over the years, and Web 2.0 has allowed fans to put him in their own tales as well. The dark, landmark short "Dead End" is one of my favorites, as it plays on many of the grim aspects of both Batman and the comic book medium that are so appealing. This film is funny for more than showing how superheroes treat each other when not in crisis management mode. Showbits contributor Hiphopguy23 hates the Man of Steel for having every other character's superpower, usurping any other hero's usefulness. It's past time to see him and his god-like brethren put in their place — and the quintessential Boy Scout's uncharacteristic riposte is a great zinger. This is just a small sampling of the creative output of the Batman fan community; a more complete index can be found at BatmanFanFilms.com. And if you too are uninterested in today's theatrical release, check out Dayton Ward's Batman gallery, which takes the audio and action of the Dark Knight trailer and recreates it using a variety of media, from animation to LEGOs. Finally, remember that the animated film Batman: Gotham Knight is now available on DVD, serving as a bridge between Batman Begins and The Dark Knight.